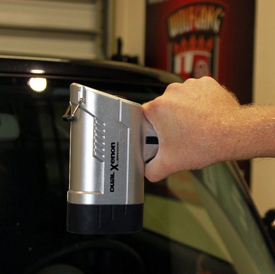 The Brinkman Xenon Swirl Finder Light is one of the handiest tools ever invented when it comes to removing swirls out of your car's finish. I first learned about this specific type of flashlight back in March of 2005 while working as an Instructor for an advanced class on how-to wet-sand paint and then use a rotary buffer to remove sanding marks along with Kevin Brown, another well-known Professional Detailer and Rod Kraft a Field Rep for Meguiar’s and also an accomplished detailer himself. Rod brought the Snap-On Tool version which is harder to obtain for most people. A few months later, my good friend and Professional Detailer Joe Fernandez, who goes by the forum nickname SuperiorShine on all the detailing discussion forums and who was also at the Advanced Class in 2005, came by a shop where I was working on a car called the Panic Parrot. He showed me the Brinkman version of the light Rod had shown us a few months earlier and let me test it out. 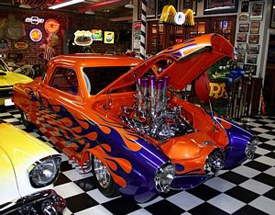 Here’s the car I was working on along with Richard Lin for a how-to video, a 1950 Panic Parrot Starlight Coupe painted candy tangerine with purple flames. Because it is a true show car, it had an exceptional finish with only very light swirls but the standard for a show car like this is zero swirls. If you look closely, you can see the tell-tale sign of the Brinkman's dual light bulbs in this shot of the passenger's side fender. There were more swirls in the paint on this show car but this is the only picture I have that shows the bulb reflection of the Brinkman that documents how long I've been using this light thanks to Joe. Time Stamp on these pictures go to 6/22/2005 The Swirl Finder light let us know the paint only need light correction work and thus we only used a cleaner/polish with a DA to reach our goal. The Brinkman Swirl Finder Light doesn't have to show gross swirls to be of value, it just has to light up the paint like the sun. 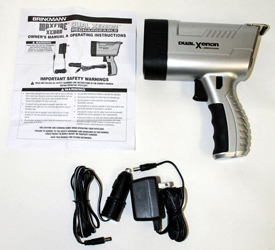 Ever since learning about this flashlight I've incorporated it into all my classes and shared it with the students as a way of inspecting their work as well as using it myself for all the cars I detail to check my own work and progress. The Brinkman Xenon Swirl Finder Light duplicates what bright sunlight will do and that is expose swirls so your eyes can more easily see them. With the Brinkman Xenon Dual Bulb Swirl Finder Light, you have the convenience of shining the light whenever you want and wherever you want. You have total control. With the sun... well besides having to move the car into the sun you have to hope the sun is actually out in the first place, which limits you to summer months for most regions. The first version with a long e and the second version with a short e.
I prefer the long e version. The feature that I like the most about the Brinkman Swirl Finder Light is that is uses special Xenon bulbs to shine intense light on paint imperfections, which enables your eyes to more easily see swirls and other defects. 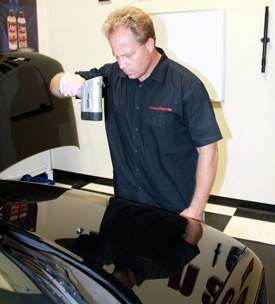 A car's paint finish can look great in the shade or indoors, but under the intense scrutiny of the swirl finder light, all of the imperfections are revealed. 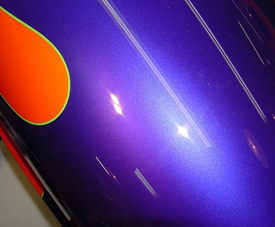 With the ability to see everything in the paint clearly, I can select the correct polisher, pad and swirl remover to polish the paint to perfection. The Brinkman Swirl Finder Light shows swirls in much the same way the sun shows swirls only you don't need to move your car into the sun in order to see the swirls, instead you simply pull the trigger on gun-style flashlight and light up the paint while inside your garage or detail shop. The Brinkman Swirl Finder Light is one of the most valuable tools you can own and every detailer and serious car enthusiast should have in their arsenal. For enthusiast and pro detailers, you can use the light to gauge your polishing progress instead of spending valuable time moving a car in and out of the garage just to check your work. If it's cloudy outside or the middle of winter when the sun isn't high overhead, (where it needs to be in order to shine down on the horizontal panels), the Brinkman Swirl Finder light takes the place of the sun and gets the job done. When you're working on vertical panels it's not realistic to try to move your car around to position it in such a way as to reveal the swirls. The Brinkman Swirl Finder Light is invaluable when checking your work or showing a customer the true condition of their car's paint. Two powerful Xenon bulbs produce a high intensity beam of light so you can easily spot imperfections. The Brinkman Swirl Finder Light easily adjusts from one beam to two beams to increase or decrease the brightness. 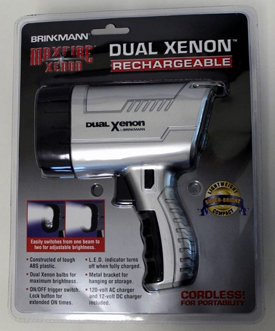 The Brinkman Swirl Finder Light uses a rechargeable Ni-Cd battery and includes both a 120-volt AC charger for wall outlets and a 12-volt DC charger/adapter for charging it from the cigarette lighter in your vehicle. The car charger enables Mobile detailers to keep the light charged while driving to the next job. 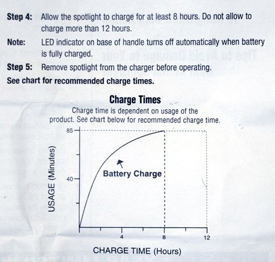 A LED indicator glows red when the battery is charging and goes off after full charge is reached. 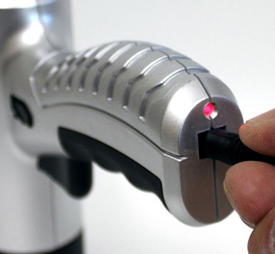 The Brinkman Swirl Finder Light is built out of rugged ABS plastic with a pistol grip handle. It has a metal swivel hook to enable you to hang it up inside your garage or inside your detailing rig. The Brinkman Swirl Finder Light is ideal for anyone who details for pleasure or profit but for professionals in particular, this light is a small investment which enables you to show your customers you’ve completely removed all imperfections. This demonstrates you are a knowledgeable professional and builds confidence in your clientele for repeat work as well as referrals. Using the Brinkman Swirl Finder Light is pretty straightforward but here's a few tips to get the best results when exposing swirls. You want to hold the Brinkman Swirl Finder Light about 12" to 16" away from the surface you're inspecting and hold it at an angle so that the light bounces back to your eyes. 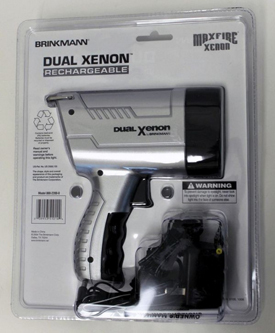 After you remove the light from the packaging, the first thing you want to do is charge the battery until the light goes off, this may take up to 8 hours but less than 12 hours. Don't leave it plugged in longer than 12 hours per manufacturer's instructions. 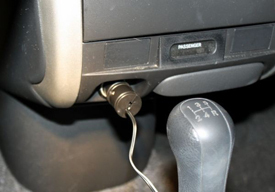 When the battery is low on charge, a red light will glow after the charger is plugged into either a wall socket or a cigarette lighter in your car. Besides being a great light for exposing and highlighting swirls, it's also handy as a flashlight for around the house, in the car or on a camping trip. I keep a fully charged Brinkman Swirl Finder Light in all vehicles just in case I run into someone that thinks their car is finished when we detailers know that the frosting on the cake is a swirl-free finish. 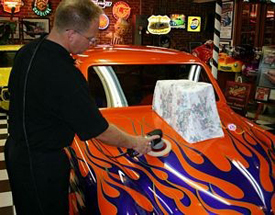 With a Brinkman Swirl Finder Light you can quickly and easily show a potential customer the problem with the paint on their car. Not only will the Brinkman Swirl Finder Light enable you to show a potential customer the problem, but will instantly become a topic of curiosity in and of itself and show the potential customer you're serious about your craft.